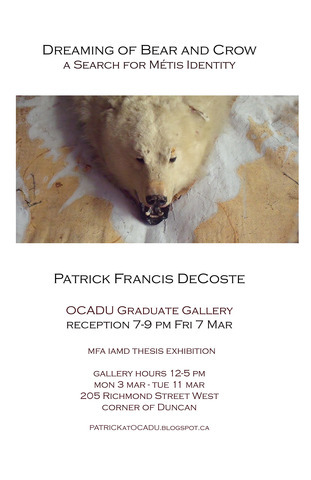 DeCoste, Patrick (2014) Dreaming of Bear and Crow A Search for Métis Identity. Masters thesis, OCAD University. Dreaming of Bear and Crow is an art project that asks how my emerging Métis identity might be located and expressed through a historical Indigenous dream. Five hundred years ago, a young Mi’kmaw woman dreamed of the coming of the French to her shores in Nova Scotia. Her dream announced the genesis of my Métis ancestry and is the subject of my research and art practice. My research included an examination of a text written in 1869 by Silas Rand and engaged site as simulation during a summer art residency on Georgian Bay. My research was expressed through an interdisciplinary art exhibition featuring acrylic paintings on a polar bear, a spirit bear, and other taxidermy animal skins. Yet a full understanding and embodiment of a Métis identity remains challenged by a communal disconnect, the geographic and cultural distance between Toronto – where I live – and Nova Scotia – where I was born. Art, Identity, Métis, Mi’kmaq, Acadian, History, Dream, Painting, Animal Skins.